*Authorized Valcourt Dealer* Northern Fireplace has been delivering first class products since 1995. Our friendly staff is standing by to help you find the right fireplace, stove or insert for your needs from our vast selection. However, sales are just a part of what we do. We are also pleased to provide expert installation—you can have confidence knowing the work is always done right! Our mission and purpose is to supply, install and service quality, energy efficient fireplaces and other hearth products in Saskatchewan and Alberta. Providing top of the line service for all of your plumbing needs. As with all of our services we provide the highest quality of work while keeping your budget and comfort in mind. Mid West has both Commercial and Residential departments that focuses on providing Plumbing, Cooling, Heating, HVAC, Custom sheet metal and Retro fits for single family dwellings as well as multi-family dwellings, from small to large commercial jobs. We strive to achieve and maintain a high standard of quality workmanship and continually focus on maintaining a professional working relationship with the customer. What should you know about buying a fireplace in Regina? Since wood smoke contributes to air pollution, many cities have banned the use of wood-burning units. If you’d like to buy a wood burning unit, check the Regina, SK city policies first. If your home already has a wood-burning unit that you’re concerned about, contact a fireplace manufacturer to replace your wood-burning unit with an environmentally friendly electric or gas alternative. Gas inserts can be efficient heaters and may lower your electric-heat bill. Many adjust to provide high heat on a cold night or a low-burning flame for ambience. Interior fireplaces and mantel designs are as varied as home interiors. From custom fireplace mantels made to conceal a flat-screen TV to custom hearth designs with elaborate Renaissance-style stone mantels, the latest designs can be found by visiting Regina, SK fireplace showrooms. Find fireplace manufacturers and showrooms, plus fireplace installation professionals, on Houzz. 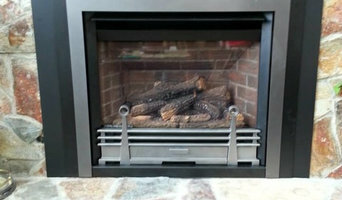 Go to the Professionals section to find Regina, SK fireplace design and installation experts.